HAMPTON, Va. (January 27, 2019) – Hundreds of Hampton University students, alumni, faculty, staff and community members including City of Hampton Mayor Donnie Tuck and U.S. Congressman Bobby Scott, attended the unveiling of the latest addition to campus, Legacy Park, on a beautiful Sunday afternoon. 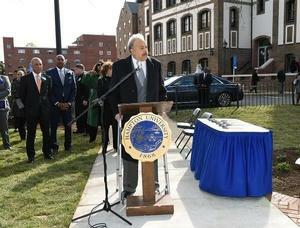 The opening of Legacy Park, which was commissioned by the Hampton University Board of Trustees, culminates a full year of celebration of the leadership of Hampton University. 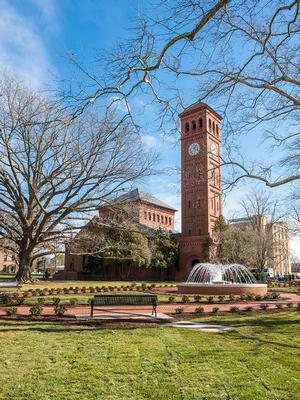 Legacy Park is located between Hampton’s noted historical landmarks Memorial Church and Ogden Hall, faces the campus' scenic waterfront. 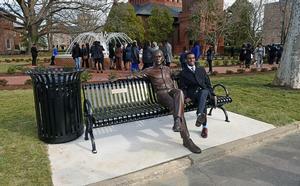 The intricately designed park includes sculpted benches and statues commemorating the likes of US Presidents, Civil Rights icons, HU alumni and a special tribute in statue to the founder of HU Gen. Samuel Chapman Armstrong and our visionary President, Dr. William R. Harvey, the longest seated university president in the country. 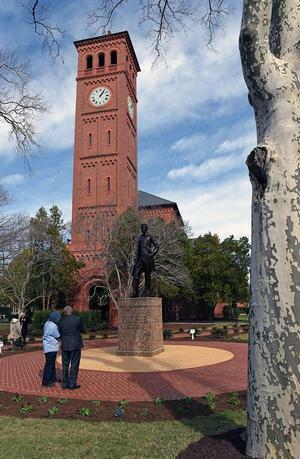 The sculpted figures in the park represent members of the Hampton family, as well as friends, who have studied, worked and demonstrated support of Hampton’s mission of academic excellence and character building in an outstanding manner. During the ribbon cutting ceremony officially unveiling this new and beautiful campus landmark, Hampton University President, Dr. William R. Harvey provided an inspirational and heartfelt message to the audience in attendance about Hampton University’s founder, Brig. General Samuel Chapman Armstrong. 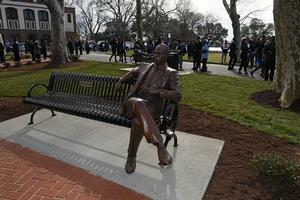 The unveiling coincides with Hampton University’s Founder’s Day. After his sentimental and emotional message about General Armstrong, Dr. Harvey spoke about Legacy Park and why some of the individuals are being memorialized in this new campus landmark. 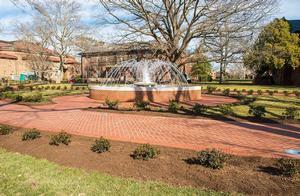 “It’s always exciting to unveil a new campus project. The Lord has blessed me and my team, and my family to be able to provide the leadership for some 41 years, and we have built 29 structures, but this is something that is new. The area that we are getting to unveil now, Legacy Park, is one that will further contribute to the beauty of this outstanding campus, while standing as a lasting memorial of people who have made a lasting impact on us. 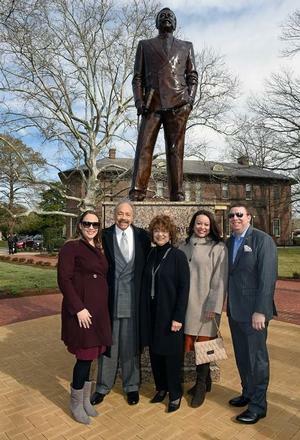 Legacy Park was established by the Hampton University Board of Trustees, under the leadership of Chairman Wesley Coleman and we wanted to memorialize a few of the people that have had a major impact on this great institution,” said Dr. Harvey. “We understand why most of these people are being memorialized, but some may not be as obvious. William Howard Taft, when he was President of the United States and Chief Justice of the United States Supreme Court, was president of the board, basically he was Chairman of Hampton’s Board. Think about the influence that a sitting President had. President Taft contributed to Hampton University immeasurably. I want you to also think about Susan B. LaFlesche, you may not know about her. She was the first Native American to get a medical degree in the United States of America. 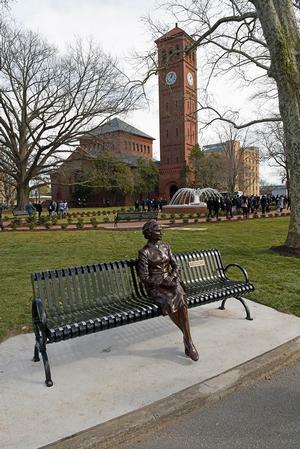 She was a Hampton grad,” Dr. Harvey said. “Some of you may remember Reuben Burrell. He was the most cantankerous man I’ve ever seen in my life. He was fussy, but he got the job done,” Dr. Harvey said with a smile and some of the audience members who knew Mr. B., laughed. The sculptures themselves in Legacy Park were created by artist Jon Hair. “I love commemorating people in history because I think they need to be memorialized but my real impetus is that seeing them will inspire others to do great things in their own lives,” said Hair. - Mary Jackson: an African American mathematician and aerospace engineer at the National Advisory Committee for Aeronautics (NACA), which in 1958 was succeeded by the National Aeronautics and Space Administration (NASA). She worked at Langley Research Center in Hampton, Virginia, for most of her career. She began as a computer analyst at the segregated West Area Computing division. She took advanced engineering classes and, in 1958, became NASA's first black female engineer. Jackson's story is featured in the non-fiction book "Hidden Figures: The Story of the African-American Women Who Helped Win the Space Race." She is one of the three protagonists in Hidden Figures, the film adaptation released the same year. Jackson graduated from Hampton University in 1942.